For anyone who is looking for a good tutorial on Mage Knight, I would recommend Box of Delights on YouTube as Rick does a great job of explaining allot of weird rules. Thanks Richard! I totally should have mentioned Box Of Delights on the podcast, I watched all of his solo Mage Knight videos before playing and they were really helpful. After thinking about the discussion on solo games, I’ve got a couple of ideas. First in regards as to why would anyone want to play a solo game instead of with a group? I think it was Jim that answered this one fairly well by saying sometimes you just aren’t in the mood to play certain games with others and a short solo game is a good way to kill some time. On the flip side, sometimes you just can’t find people that want to play or are willing to dedicate allot of time to give a game its due justice. I bought a copy of Twilight Imperium probably 2 years ago and still have yet to get it to the table. This was my “epic” game that I’ve wanted to play not just because it looks cool, but that it would force me and a group of others to really devote time to the game and through that experience not only get to know one another even better, but share an experience that few have (actually finishing a game). I know my tastes in games have a wide variety from the classics, to basics, to the weird, and even the hotness. Sometimes all that variety can make for a necessity to solo as your choices are not another’s cup of tea. Second, as Eric pointed out, even taking a game to play on your own is great for killing some time, but of all the things mentioned, the visual appeal is what draws people which is my second point. If you are sitting in a breakroom or fastfood place and break out your phone or tablet to play a game, no one really pays much attention. Set out a game like Friday (which I did do at a McDonald’s) and you’d be surprised to see people start a conversation just to know what the heck you are playing. It was doing this that I met a fellow gamer and told them about the hobby. All that said however, I do disagree that if one engages in video games, you are wasting your time. I have yet to beat Skyrim, but I enjoy picking it up from time to time just to wander around, fighting enemies and doing quests. I know I can beat the story, but the experiences I encounter however random they may be make the game so worthwhile. Yes, the end is not in sight, but there are some games I’ve played that have ended on the table that I wish had a little more open creativity (we’ll see how my copy of Myth plays out with that). Finally, sometimes the crowd just dictates that you should solo. I know I like to present a game and be able to explain how to play it with relative ease and that requires me to open the box, maybe set up a 2-3 player game and play all sides on my own. This can be fun and frustrating at the same time. However, if I’ve put all that effort into a game and the group is very ADHD, not focusing on the game, and leaving the table constantly to see what else is going on (which is even worse when it is their game that they are trying to learn to play), then my time and theirs is being wasted. I would rather stop the game, preserve the rest of the time that they and I may have and just try something different or find another group. I have yet to rage quit or flip the table (I’ve wanted to I admit), but at the same time that does nothing to resolve the problem. Personally, I think having a small solo game or 2-player game in your bag for a game night will save you a headache (or give you one depending on the difficulty). While our hobby is a social one, sometimes being a little anti-social when necessary saves you and others from frustration later. I do like your point about sometimes backing away fro the group to solo. I have recently simply gone home 15 minutes after arriving at a game night simply because I wasn’t into either the group dynamic or whatever games were hitting the table. I contemplated grabbing a solo game off the shelf. I have also stayed and regretted it when the game/group didn’t fit the mood, and I probably ruined someone else’s fun. 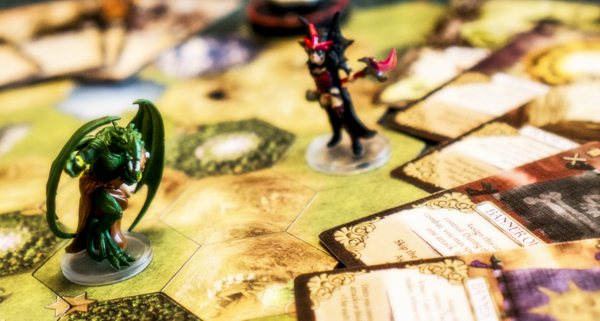 Why do a solo board game rather than fire up a PC or console? When you work all day on computers… it all makes sense!